Mazda is a small company relying on its engineering and sporty image. After the partnership between Mazda and Ford fell apart, the CX-5 was the first SUV developed solely by Mazda. Since its introduction in 2012, the CX-5 sales grew steadily. 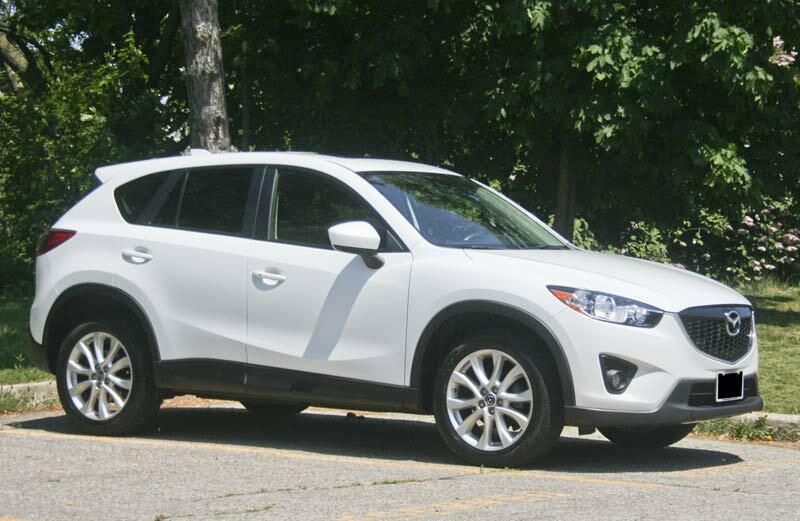 By 2015, the CX-5 became the best-selling Mazda vehicle in the US outselling the popular Mazda 3. The 2013-2017 Mazda CX-5 is a compact 5-seater SUV with a 2.0L or 2.5L Skyactiv 4-cylinder engine. Unlike many other car makers, Mazda continues to use a proven conventional automatic transmission. 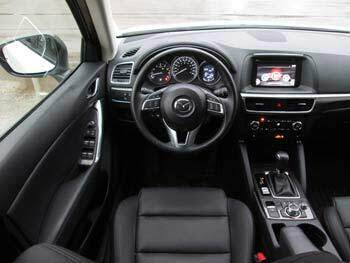 The CX-5 is also available with a manual transmission, but only in front-wheel drive configuration. 2016 redesign: For 2016, the CX-5 got upgraded interior and different infotainment system; compare these two photos, click on the photo to see the larger image. The 2013-2015 CX-5 has an audio system with an optional TomTom navigation. The 2016 CX-5 comes with 7" Mazda Connect, with a commander switch. The only thing we have our doubts is a new electronic parking brake in 2016.5 models. The manual hand brake was simple and reliable, why make things more complicated? Fuel Economy: Mazda CX-5 is one of the most fuel-efficient SUVs. The 2014-2016 2.5L AWD CX-5 gets 24/29 MPG city/hwy, or roughly 428 miles (689 km) to a tank, with 80-percent highway driving. The 6-speed manual front-wheel drive 2013-2016 CX-5 with the 2.0L engine is rated at 34 MPG (!) highway, 26 MPG city. The CX-5 uses regular gasoline. Driving experience: It's a light-weight sporty SUV and that's exactly how it drives. You feel most imperfections in the pavement, but the vehicle handles very well in turns and emergency maneuvers. Mazda CX-5 engine. Click for larger image. 2.0L vs 2.5L Engine: The 2.0L engine lacks power with full load, but is very fuel efficient, especially on the highway. The 2.5L (in the photo) offers decent acceleration and is also good on gas. Both engines have identical design with direct injection. Both have a maintenance-free timing chain; there is no timing belt. A timing chain does not require regular replacement. Both engines are proven reliable, provided regular maintenance. How capable is CX-5 4WD system? The all-wheel drive system is simple and fully automatic. There is no switch to disengage AWD or lock the rear diff. Front wheels are powered at all times; the torque is sent to the rear wheels when needed. Many modern SUVs have exactly the same design. It's certainly not an off-roader, but handles well on snowy roads. Safety: Stability control system, side and side curtain airbags are standard. The 2014 and 2015 CX-5 got 5 stars overall in the NHTSA crash tests. The 2013 and 2016 CX-5 received a 4-star overall rating. Overall: The CX-5 is one of the best compact SUVs. Consumer Reports rates it above average for reliability. Fuel economy, sporty handling, sharp interior and visibility are the main CX-5 selling points. Should you buy or avoid a turbocharged car? What mileage is OK for a used car? Is it OK to buy a used car that was a rental? Common problems: Many owners report Bluetooth connectivity issues, especially with iPhone. Updating the firmware solves some of the issues. In Mazda Connect system, you can find the firmware version under Settings » System » About. Your dealer can update the firmware. Some owners reported the connectivity issue resolved after replacing the Bluetooth module. This forum offers several fixes. You can find pairing information and check compatibility of your phone at this this Mazda website. A tire pressure warning light coming on is also often mentioned. In the CX-5 the tire pressure monitoring system works by comparing speed of all tires. The warning light may come on if one of the tire has a nail, but also if the tire pressure monitoring system has not been initialized after tire rotation, tire swap or after adjusting tire pressure. There is a reset button on the left side of the dash. You can find the information how to perform Tire Pressure Monitoring System Initialization in your owners manual under "Tire Pressure Monitoring System." An owners manual can be downloaded in .pdf format from Mazda USA website. A faulty transmission shifter assembly may cause the radio to stay on when the car is turned off. Several owners reported the problem fixed after the shifter assembly has been replaced. It's $360-$500 repair if not covered under warranty. A bad mass air flow sensor may cause the Check Engine light as well as stalling. It's an easy to replace and not very expensive part. Read more about the mass air flow sensor. Mazda CX-5 OEM 17" Yokohama Geolandar tires were rated with three stars out of five at TireRack.com. Several owners reported better ride quality and tire life after switching to different all-season tires. For example, one of our friends reported much improved ride after he installed Michelin Premier tires on his CX-5. In "Rust Belt" states and Canada, corrosion at rear brakes may cause them to wear prematurely. There are several complaints at the NHTSA website. We strongly recommend having the brakes inspected and serviced regularly to keep them safe. Maintenance: Mazda doesn't mention the automatic transmission fluid change in the maintenance schedule. That said, the transmission fluid still gets dirty after 80-100K. 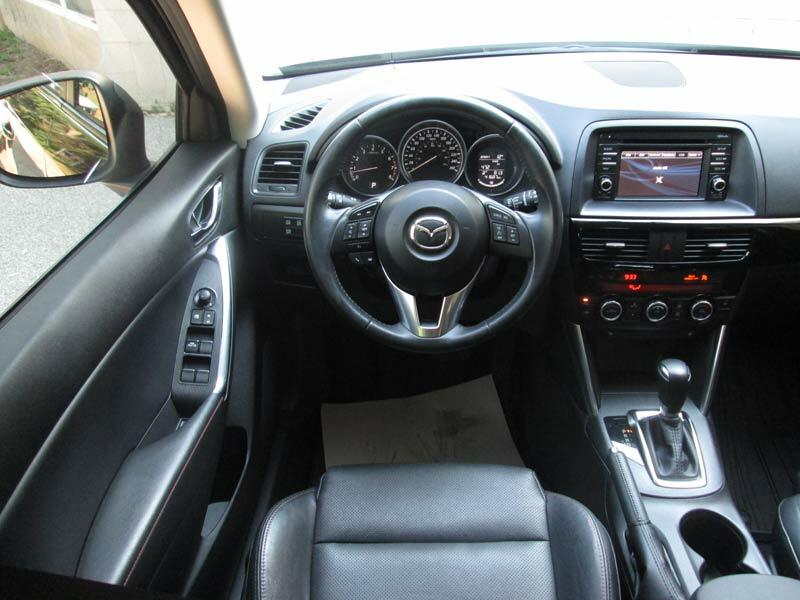 The automatic transmission takes a special Mazda transmission fluid. 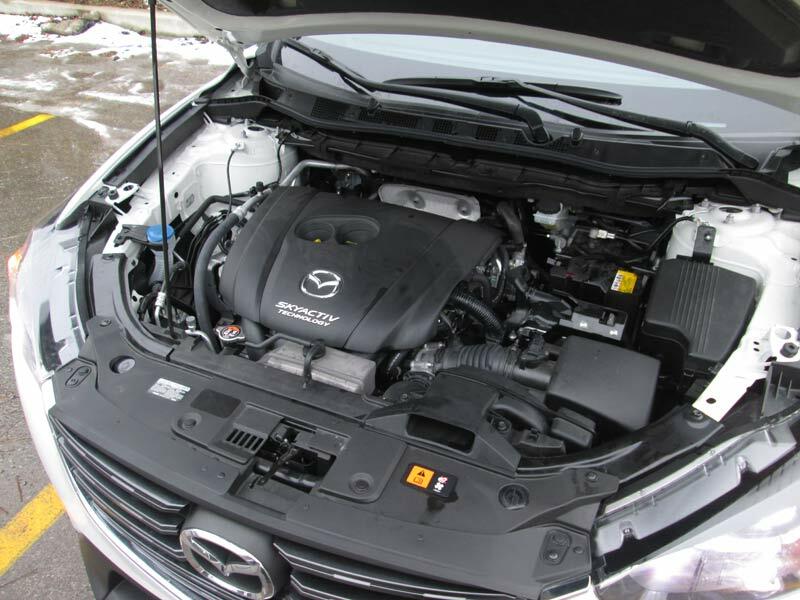 If you want to change transmission fluid, get it done at a Mazda dealer. We recommend changing transmission fluid, as well as rear differential and transfer case oil every 60-80K miles. Brakes, especially on the rear axle, need to be serviced at least once a year. Mazda Connect - how it works, FAQ, How-to guides. Mazda TomTom navigation - for 2013-2015 CX-5: help, map updates.